The way Doug Murray sees it, the quicker technology moves and changes, the more it means sales and success for his company, Delco Solutions (www.delco-solutions.com). Murray, 36, and his partner, Kevin Basquill, 35, formed their company in early 2012. Each brought a different skillset, but they shared a desire to get ahead of the curve of the coming merger of the AV industry with IT/networking. 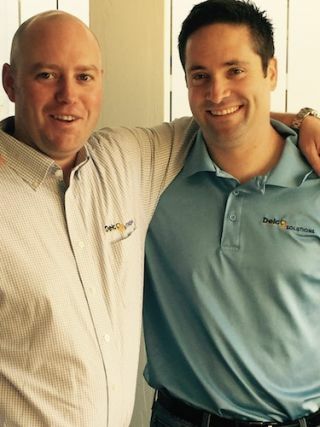 Delco Solutions partners, Doug Murray (left) and Kevin Basquil (right).Initially, Delco attracted customers through referrals and did well. What was missing was the social networking/SEO element—the social networking element to get that “snowball effect” from Google to the company website, and on to social media sites. So Murray called a friend. And that friend is a headhunter. Enter Doug Foulkes, 27, Delco’s director of marketing. Foulkes had worked for a handful of non-AV startups creating business plans and marketing materials. “I took an interest in web marketing because there’s always something new to learn, and you have to stay current on the latest trends to remain competitive, just like the AV industry,” he said.